It was coming up on two weeks since our last SOTA expedition and my lady and I were getting twitchy, a sure sign of SOTA addiction. Despite the rather unpromising weather forecast – showers, 90% probability of rain, maximum temperature 12 degrees – we agreed it was high time to go and activate another Summit. There are plenty in the area but we thought we’d like to activate one we hadn’t been to before, and a check of the map suggested that Munderoo Trig, VK2/RI-006 would fit the bill. This is a 4-point Summit shown in the SOTA list somewhat cryptically as NSW 6884, which I guess is the reference number for the trig point. 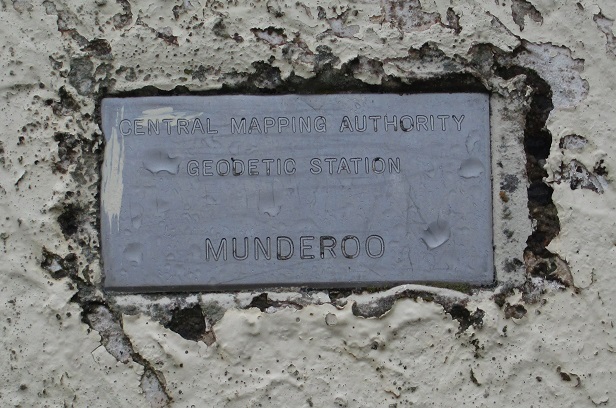 Considering that VK2/RI-005 is also called Munderoo, despite being located some 45km away to the west, using the trig point reference probably helps to reduce confusion. We set out from home under lowering clouds and intermittent drizzle, but there were occasional patches of sunshine and we were hopeful that when we reached the Summit we’d find one of those parked there for long enough to complete the activation. Well, one can hope! We took the Hume Highway to Holbrook and then the Jingellic Road, turning onto Linden Roth Drive heading towards Tumbarumba. On the way we passed through drizzle, bright sunshine, heavy rain and sometimes all three together. The day had a very wintery look about it and we were glad of the Hilux’s excellent heater. On this trip I was testing the Avenza PDF Maps app for the iPad, with the 1:25,000 series map sheet (8426-2N) loaded. This app uses the geocoded PDF map together with the iPad’s built-in GPS for navigation. Once the PDF map file is loaded the app does not require an internet connection. A work colleague pointed me to this app and initial investigations had proved promising, but this was the first time I’d used it in the field. 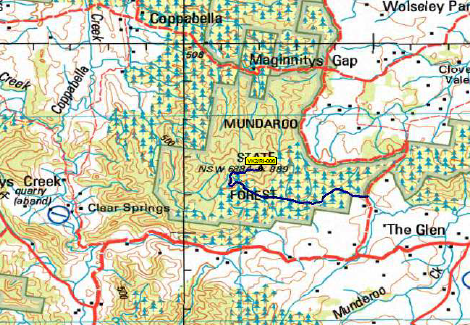 I am pleased to report that it worked brilliantly, showing us our position overlaid on the topo map and that helped tremendously in finding our way through the confusing maze of logging trails in the Munderoo state forest. If you’re interested in this app, check out the Avenza web site at http://www.avenza.com and the app itself is available from the Apple app store (see https://itunes.apple.com/au/artist/avenza-systems-inc./id387212805) and on Google Play for Android devices (see https://play.google.com/store/apps/details?id=com.Avenza). This app will only be of use if you have access to a source of geocoded PDF maps. You can buy these from various places via the internet. The PDF map suggested that the simplest way in would be to follow Blue Hills Road. This is the main logging trail that runs through the forest from east to west. There are plenty of other options but these are all minor trails and in the wet conditions we thought those trails were likely to be difficult if not impassable. A couple of them lead much more directly towards the Munderoo trig than the trail we chose but they traverse steep slopes, so we gave them a miss. Even so, the condition of Blue Hills Road was not that fantastic, with plenty of slushy mud to negotiate. The Hilux was plastered with it by the time we reached the Summit. 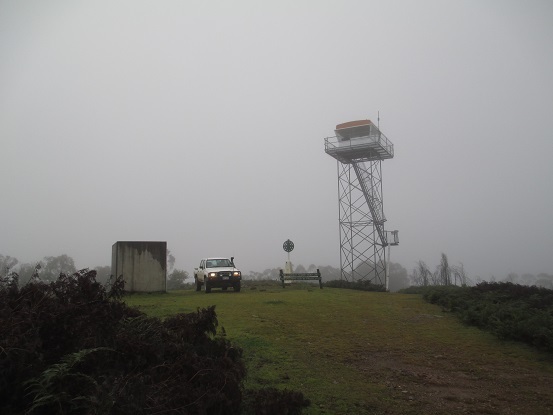 We drove right up onto the Summit and stopped beneath the fire observation tower. The hilltop was shrouded in dense, damp mist and looked bleak and very chilly, not at all conducive to SOTA operations. 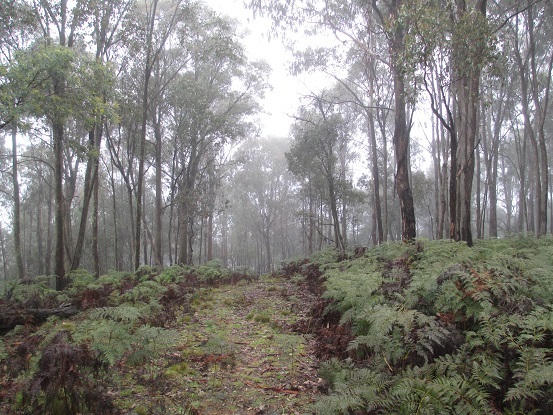 Fortunately, the eucalypt forest extends to just below the Summit and is within the activation zone. Back down there we were a little more sheltered and there were plenty of convenient branches to hang the antenna from. Since it wasn’t actually raining, although there was plenty of water dripping from the trees, we decided to set up and go for a quick activation. 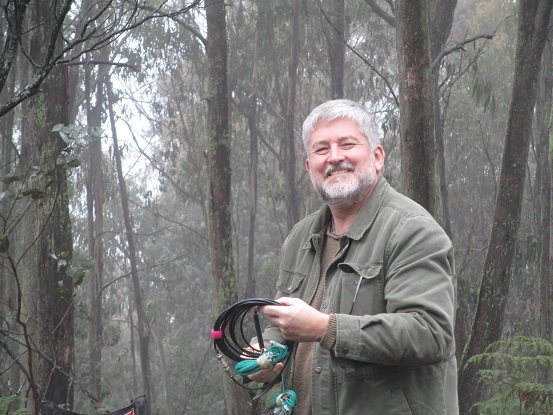 It is one of life’s little mysteries, I think, how water droplets falling from tree branches can wait until the precise moment when one is bending over to pick something up or unpack the SOTA gear, and then they drop with a cold, clammy smack on the back of one’s neck. Then they trickle down between the shoulder blades inducing a Keating-esque shiver that runs up and down the spine. Dodging these, we picked a convenient spot and rigged the antenna in the customary ten minutes. There was a sniff of a 3G signal on the Summit and SOTA Goat spotted VK2QR/3 on VK3/VG-048 on 7MHz, so I thought a S2S with Rob would be a good start to this activation. While setting up, the low cloud had dropped even lower and the Summit was now enveloped in a thick mist that condensed on everything, causing all sorts of problems including the inability of my fibre-tip pen to write in my log! Fortunately my lady came to the rescue and held a golf umbrella over us while I completed the activation. We needed a third person with us to take a photo of that for posterity. Not only did my lady hold the umbrella, she also lent me a cosy, woolly beanie without which I would have been very chilly indeed. Now that is dedication beyond the call of duty! I was a little confused when I arrived on frequency to find Rod, VK2TWR running the pile-up but soon discovered that Rod and Rob were doing a joint activation, so I worked them both before moving down the band a little and calling CQ. Then over the next 30 minutes I worked VK1EM, VK2KEV, VK3PF, VK2YK, VK2IO/P, VK2UH, VK3FQSO, VK3CAT, VK2GAZ, VK1MA/3, VK3AFW, VK3BQ/M, VK3UH, VK5PAS, VK2LEE, VK3ANL, VK2EIR, VK1NAM, VK3MCD, VK3DET, VK3YY, VK3UBY, VK2KTT, VK1DI, VK5WG, VK2HV, VK5BJE and VK3YAR before the cold and damp conditions suggested that closing down and getting into the ute with the heater on would be a Very Good Idea. So when there were no more callers – going once, going twice, GONE! – I switched off the FT817 and we packed up in record time. We had our lunch sitting in the ute with the engine running and the heater going full blast, since the condensing mist had by this time developed into light rain and gave every indication of proceeding to heavy rain in the very foreseeable future. In a momentary lull in the rainfall I hopped out and snapped a couple of photos of the Summit and then we made our way back down, slipping and slithering through the wet mud on the trail. The Avenza PDF Map app proved very useful and will be part of my SOTA expedition kit from here on. Don’t forget the beanie when you’re out and about in cold weather. I can’t hang about doing lengthy activations in this kind of weather. Short and sharp is the rule. My SOTA activations are never solo affairs and my lady enjoys them as much as I do. I was humming and ha-ing about going out on this trip but she encouraged me to go, and as usual she was right. 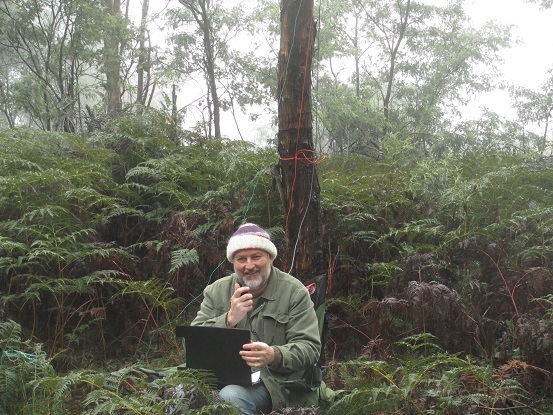 Horrible day though it was weather-wise, we had a great time and got another successful activation in the SOTA log. My lady is unquestionably the most wonderful person in the world, and I am the most fortunate. She helped set up, she lent me her beanie, she held the umbrella while I did the activation, she helped pack up again and, to top the lot, she produced a great picnic lunch complete with a flask of hot tea. How fantastic is that?